Startling developments in Gaza highlight the need for a change in Western policy toward this troubled territory of 1.3 million persons. Gaza's contemporary history began in 1948, when Egyptian forces overran the British-controlled area and Cairo sponsored the nominal "All-Palestine Government" while de facto ruling the territory as a protectorate. That arrangement ended in 1967, when the Israeli leadership defensively took control of Gaza, reluctantly inheriting a densely populated, poor, and hostile territory. Nonetheless, for twenty years Gazans largely acquiesced to Israeli rule. Only with the intifada beginning in 1987 did Gazans assert themselves; its violence and political costs convinced Israelis to open a diplomatic process that culminated with the Oslo accords of 1993. The Gaza-Jericho Agreement of 1994 then off-loaded the territory to Yasir Arafat's Fatah. Those agreements were supposed to bring stability and prosperity to Gaza. Returning businessmen would jump-start the economy. The Palestinian Authority would repress Islamists and suppress terrorists. Yasir Arafat proclaimed he would "build a Singapore" there, actually an apt comparison, for independent Singapore began inauspiciously in 1965, poor and ethnically conflict-ridden. 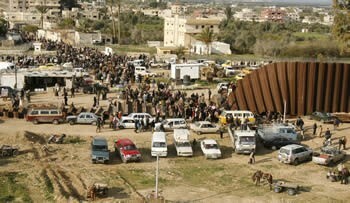 Gazans crossing into Egyptian territory on January 23 through a breach in the 13-meter tall fence. Of course, Arafat was no Lee Kuan Yew. Gazan conditions deteriorated and Islamists, far from being shut out, rose to power: Hamas won the 2006 elections and in 2007 seized full control of Gaza. The economy shrunk. Rather than stop terrorism, Fatah joined in. Gazans began launching rockets over the border in 2002, increasing their frequency, range, and deadliness with time, eventually rendering the Israeli town of Sderot nearly uninhabitable. Faced with a lethal Gaza, the Israeli government of Ehud Olmert decided to isolate it, hoping that economic hardship would cause Gazans to blame Hamas and turn against it. To an extent, the squeeze worked, for Hamas' popularity did fall. The Israelis also conducted raids against terrorists to stop the rocket attacks. Still, the assaults continued; so, on January 17, the Israelis escalated by cutting fuel deliveries and closing the borders. "As far as I'm concerned," Olmert announced, "Gaza residents will walk, without gas for their cars, because they have a murderous, terrorist regime that doesn't let people in southern Israel live in peace." That sounded reasonable but the press reported heart-rending stories about Gazans suffering and dying due to the cutoffs, and these immediately swamped the Israeli position. Appeals and denunciations from around the world demanded that Israelis ease up. Then, on January 23, Hamas took matters into its own hands with a clever surprise tactic: after months of preparation, it pulled down large segments of the 12-km long, 13-meter high border wall separating Gaza from Egypt, simultaneously winning goodwill from Gazans and dragging Cairo into the picture. Politically, Egyptian authorities had no choice but uneasily to absorb 38 wounded border guards and permit hundreds of thousands of persons temporarily to enter the far northeast of their country. Israelis had brought themselves to this completely avoidable predicament through incompetence – signing bad agreements, turning Gaza over to the thug Arafat, expelling their own citizens, permitting premature elections, acquiescing to the Hamas conquest, and abandoning control of Gaza's western border. What might Western states now do? The border breaching, ironically, offers an opportunity to clean up a mess. 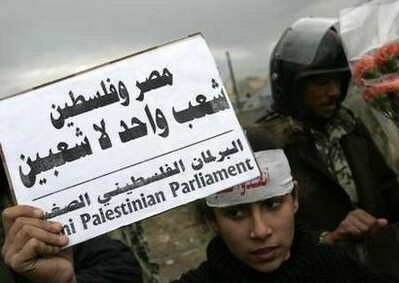 "Egyptians and Palestinians are one people, not two peoples," says a sign held by a Palestinian on Jan. 29, 2008. It's hard to divine what benefit American taxpayers have received for the US$65 billion they have lavished on Egypt since 1948; but Egypt's absorbing Gaza might justify their continuing to shell out $1.8 billion a year. Jan. 30, 2008 addendum: The argument fits into a larger approach that I delineated in 2005 at "Jordan to the West Bank, Egypt to Gaza." Feb. 7, 2008 update: I discuss today how to carry out the above policy at "How to Turn Gaza Over to Egypt." Feb. 27, 2008 update: For others who agree with this argument, see "Gaza to Egypt – Voices of Support."